The term 'agitation' describes a syndrome of excessive motor activity, usually nonpurposeful and associated with internal tension. For intensivists, agitation is not so much a diagnosis, but a consequence of more fundamental etiologies that, when expressed, result in disquietude. Agitation is important in the intensive care unit (ICU) because it can alter the diagnosis and course of medical treatment. It can cloud the etiology of underlying disease processes like a smoke screen, making effective diagnosis difficult or impossible. It may result in the inability of the patient to cooperate with monitoring and therapeutics that requires them to lie relatively still and quiet. Treatment of agitation without considering underlying causation gives the false impression of wellness when in reality end-organ damage is occurring either as a result of agitation itself, or as a result of exacerbation of underlying pathology. Prior to the technological revolution in critical care medicine, agitation was a relatively minor issue. Little could be done for critically ill patients but make them as comfortable as possible and observe them for treatable decompensations. Modern ICUs now have the potential to return critically ill patients to productivity using technological advances in monitoring and closely titrated care, effectively pinning the patient firmly to the bed with tubes and appliances. As a result of our high-tech hemodynamic monitoring and support devices, we have conferred upon the already hemodynamically unstable patient new kinds of stress we never had to deal with before, and simplistic, symptomatic 'shotgun' sedation no longer applies. The temporal lobes and the Hesh gyrus receive auditory information, modulate memory and language skills and relay information to the cortex where cognitive judgments are made and motor responses are integrated . The thalamus and basal ganglia act as relay stations between lower centers and the cortex . The brainstem enables endurance and survival capabilities, modulating heart rate, respiratory function and autonomic actions . The pineal gland is thought to modulate sleep-wake cycles . The hippocampal area including the mammillary bodies modulates spatial memory formation, declarative memory, working memory, memory indexing/storage, relating expectancy to reality, and internal inhibition. Memory is recorded in several parts of the brain at same time as 'memory molecules' for storage. These molecules are modulated by limbic system, especially the mammillary bodies. Bilateral hippocampal resection results in short-term anterograde amnesia . The hippocampus has receptors for neurosteroids, both mineralocorticoid and glucocorticoid. The mineralocorticoid receptors (high affinity) are agonized by alderosterone, and antagonized by spironolactone. The glucocorticoid receptors (low affinity) are agonized by dexamethasone. There are no known antagonists to glucocorticoid receptors. The locus coeruleus is a small structure on the upper brainstem under the fourth ventricle and is involved in the regulation of wakefulness, attention and orientation  (Fig. 1). Receptors for neurotransmission are highly specialized and recognize only specific transmitter chemicals . Neurotransmission is accomplished by at least three kinds of chemical transmitters (Table 1). Acetylcholine achieves high concentrations in the basal ganglia and account for the anticholinergic side effects of medications such as tricyclic antidepressants. The neurotransmitter dopamine is particularly active in the midbrain and limbic system, and the frontal lobes, modulating emotional responses. In its simplified form, schizophrenia is thought to be a result of increased dopamine neurotransmission activity. Norepinephrine exerts a diffuse modulating influence throughout the brain. Serotonin exerts a thalamic influence and has been implicated in clinical depression, sleep disorders, anxiety and pain. Other naturally occurring substances can exert neurotransmission activity. Branch chained and aromatic amino acids may act as false neurotransmitters during the encephalopathy of liver failure . Glutamate has been implicated in the 'Chinese food syndrome', where food with high amounts of monosodium glutamate interfere with normal neurotransmission causing confusion . 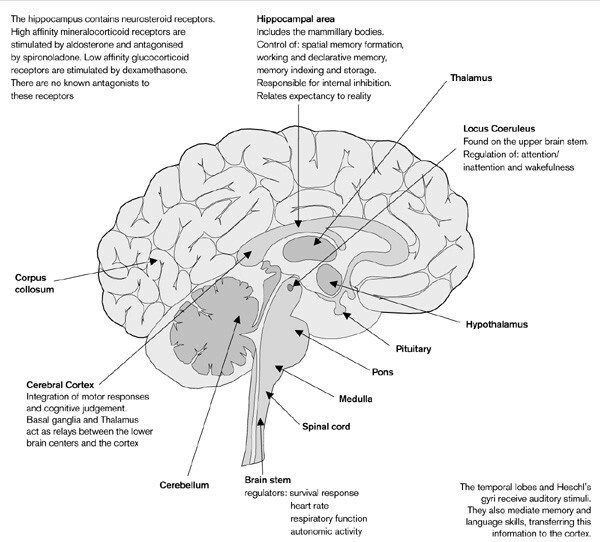 Pain neurotransmission utilizes the opiate receptors found diffusely throughout the limbic system and basal ganglia, frontal and temporal cortex, thalamus, hypothalamus, midbrain and spinal cord. Kappa and Mu opiate receptors do not meet the typical criteria for neurotransmitters. They respond to endorphins and enkephalins which are peptides rather than hormones . The anxiety producing centers of the brain. Neuroreceptors are responsible for highly selective signaling at synapses and also regulation. N-Methyl-D-aspartate (NMDA) receptors occur within the cerebral cortex, cerebellum and hippocampus . Depolarization of the NMDA complex by glycine, the phencyclidine-like drugs and aspartate results in the elaboration of excitatory neurotransmitters that increase brain metabolic activity. The NMDA receptor is unique in that it is permeable to both sodium and calcium ions, so its electrical current is both agonist- and voltage-dependent, and relatively long lived. The γ -amino butyric acid (GABA) receptors are inhibitory complexes modulated by benzodiazepines, steroids and barbiturates . The GABA-benzodiazepine complex hypothesis suggests that benzodiazepines attach to GABA-benzodiazepine complexes in the brain, enhancing chloride conduction resulting in the release of GABA. This opens a chloride channel leading to inhibition of neuronal excitation in the limbic system, resulting in anxiolysis, sedation or hypnosis, depending on dose. All neurotransmitter receptors can be 'desensitized' by a constant flux of agonists and become less responsive. This mechanism tends to prevent overstimulation at synapses by excess released neurotransmitter. Receptors may also be 'downregulated', the absolute number of receptors reduced as a response to the same kind of stimulus that results in desensitization . Stress usually produces an elevated sense of fear and anxiety which causes increased norepinephrine turnover in the limbic regions (hypocampus, amygdala, locus coeruleus) and cerebral cortex . Stress applied to laboratory animals results in a decreased density of α2-adrenergic autoreceptors in the hippocampus and amygdala, reflecting downregulation in response to elevated circulating endogenous circulating catecholamines, among other desensitizing actions . This causes an increase in responsiveness of locus ceruleus neurons to excitatory stimulation that is associated with a reduction in α2-adrenergic autoreceptor sensitivity . This phenomenon may be measured by assaying levels of platelet α2-adrenergic autoreceptors. Yohimbine activates noradrenergic neurons by blocking α2-adrenergic receptors and is thus anxiogenic. Clonidine, an α2-agonist, seems to diminish anxiety symptoms by decreasing norepinephrine transmission . Yohimbine blocks the effects of clonidine, and panic attacks can be precipitated by its parenteral administration. Behavioral sensitization to stress may also involve 'memory imprinting' alterations in noradrenergic function. This is thought to be the mechanism of the Post Traumatic Stress Disorder originally recognized in Vietnam veterans, but now recognized to be a sequelae to other prolonged inordinately stressful events . This syndrome is not uncommon following extremely stressful ICU stays, especially if the patient experienced untreated pain, anxiety or delirium . The limbic and cortical regions innervated by the locus coeruleus are those thought to be involved in the elaboration of adaptive responses to stress, eliciting increased responsiveness to excitatory stimuli when previously experienced stimuli occur again. Limited exposure to shock that does not increase noradrenergic activity in control animals increases norepinephrine release in animals previously exposed to the same kind of stress . Panic attacks, insomnia, accentuated startle, autonomic hyperarousal and hypervigilence are characteristics of noradrenergic hyperfunction . Conditioned fear and recollection of immobilization stress may be experienced by patients who have experienced traumatic emergency endotracheal intubation and mechanical ventilation in the past. In ICU patients the sensitizing factor may result from hemodynamic and metabolic decompensations as a result of multisystem insufficiency . In a panic attack, the main symptom is dyspnea; the patient feels like he or she wants to breathe but cannot. There are two kinds of panic : type one includes typical symptoms of diaphoresis and tachycardia, and is effectively treated by anxiolytic drugs including the benzodiazepines, especially low dose continuous infusions of titratable ones like midazolam and lorazepam; type two panic attacks are characterized by subjective dyspnea and hyperventilation. For this variant of the syndrome, imiprimine tends to downregulate the brain's 'suffocation alarm system' that promotes the subjective sensation of dyspnea. It is thought that this center is modulated by serotonin uptake neuroreceptors . Imiprimine, however, is not useful in the ICU because of the long therapeutic lag period and because of its many difficult-to-control side effects. Symptoms of panic attacks are easily confused with those of chronic heart failure, which a large population of ICU patients are predisposed to. In addition, metabolic imbalances associated with left heart failure and respiratory failure may precipitate anxiety de novo. Patients controlled on mechanical ventilation and chronic lung failure patients may manifest acute increases in pCO2 resulting in further catecholamine release, increasing agitation . Agitated patients tend to increase peripheral musculoskeletal metabolism, increasing lactate and carbon dioxide production . Both lactate and increased CO2 are evolutionary signals that danger is coming, prompting a responsive response to stress and potential danger. Hypercapnea stimulates the sympathetic centers resulting in tachycardia and mild hypertension, and possibly promoting panic. Increased levels of lactate and CO2 enter the brain quickly and can precipitate panic attacks . During hyperventilation, pCO2 declines, causing cerebral vessels to constrict reflexly, further limiting blood flow and O2 transport to the brain which can result in mental confusion. The treatment for heart failure radically differs from that of panic attacks and the exact etiology of each disorder must be accurately identified before treatment is begun. If the panic episode is secondary to pump failure resulting in tissue hypoxia and hypercarbia, establishing an airway and ventilation will rapidly ameliorate hemodynamic instability, resolving the agitation episode. However, if the patient's agitation results from a panic attack, aggressive airway, ventilation and hemodynamic support will only make them more agitated. In addition, effective treatment for the two different kinds of panic are different in effectiveness and complications. For type 1 panic, the 'cost' of benzodiazepines is sedation with possible ventilation impairment, the potential for tolerance, rebound and withdrawal on removal, all of which interfere with titration of ICU ventilation and hemodynamic support. For type 2 panic, the 'cost' of imiprimine therapy is the drug's side effects, usually worse than placebo for the first 4weeks of therapy, then results improve. This period of time is too long to benefit most ICU patients who suffer from relatively short duration ailments, rapidly corrected by titrated life support. Acute stress increases dopamine release and metabolism in a number of brain areas . Dopaminergic innervation of the medial and dorsolateral prefrontal cortex appears to be particularly vulnerable to stress and relatively low intensity levels of stress are capable of promoting significant responses. The prefrontal dopaminergic neurons have a number of higher functions including attention and 'working' memory, and the acquisition of coping patterns in response to stress . Amphetamines and cocaine agonize these receptors and have a similar effect as stress, resulting in symptoms such as anxiety, panic, hypervigilence, exaggerated startle reflexes and paranoia . NMDA and opiate receptors are plentiful in this area and stress-induced innervation of the fronto-cortical neurons is prevented if these receptors are selectively blocked. This increase of dopamine from the dendrites of dopamine neurons may be due to an alteration in GABA regulation of the dopamine neurons. As with noradrenergic systems, single or repeated exposures to stress potentiates the capacity of a subsequent stressor to increase dopamine function in the forebrain without altering basal dopamine turnover, suggesting that the receptors have been hypersensitized . Sensory and cognitive dissociations resulting from dopaminergic hyperfunction produce a state of fear and anxiety via direct anatomic connections from cortical brain structures to the limbic system principally through mesolimbic pathways . It is thought that this disinhibition of mesolimbic dopamine neurons causes the bizarre behavioral and cognitive symptoms experienced by patients in schizophrenia and, by extension, with delirium . Delirium resulting from dopaminergic hyperfunction is characterized by global disorders of cognition and wakefulness and by impairment of psychomotor behavior . Major cognitive functions such as perception, deductive reasoning, memory, attention and orientation are all globally disordered. Excessive motor activity frequently accompanies severe cases of delirium and, when this occurs, the resulting constellation of symptoms is called 'agitated delirium' . Integrative brain failure in the ICU environment is almost always associated with a hemodynamic or metabolic decompensation, either intra-or extracranial. The ICU environment provides a repository of typical predisposing factors of a hemodynamic or metabolic nature, including acute or chronic organic brain vascular insufficiency, endocrine insufficiency, acute or chronic cardiopulmonary decompensations, multiple organ-system insufficiency, relative hypoxia, poor tissue perfusion, multiple medications, and finally sleep–wake cycle disruption caused by immobilization, anxiety and pain . If excessive responses to dopaminergic systems contribute to the aforementioned manifestations, the neuroleptic drugs that decrease neurodopamine activity such as haloperidol should alleviate some of the symptoms, particularly hypervigilence and paranoia. Haloperidol is a butryphenone structurally similar to droperidol with mechanisms of action similar to piperazine-based phenothiazines . Haloperidol is a dopamine antagonist; benzodiazepines are GABA agonists. Theoretically, there should be a synergistic relationship between the two when used in a conjoined fashion. In addition, butryphenones such as haloperidol suppress spontaneous movements and complex behavior patterns which result from disharmonious brain function, with minimal central nervous system (CNS) depressive effect . There is little or no ataxia, incoordination or dysarthria at ordinary doses. Haloperidol appears to exert a diffuse depressive effect by inhibiting dopaminergic receptors and reuptake of neurodopamine in the subcortical, midbrain and brainstem reticular formation . A unique effect of haloperidol is a relatively strong suppression of spontaneous musculoskeletal hyperactivity and behavior that results from hyperdopaminergic brain function without pronounced sedation or hypotension . Haloperidol produces less sedation than other phenothiazines, with very little effect on heart rate, blood pressure and respiration, and it appears to have a very wide range between therapeutic doses and the dose which precipitates extrapyramidal reactions . It is thought that haloperidol's molecular structure is changed in some fashion when given orally, increasing the possibility of extrapyramidal reactions . One of the fundamental behavioral effects of intense stress is analgesia, resulting from the release of endogenous opiates in the brain stem . This analgesic effect can be blocked by naloxone and shows cross tolerance to morphine . It is unknown whether the effects of stress on endogenous opiates are related to the core clinical symptoms associated with anxiety and panic. The recent development of novel drugs (termed peptoids) that mimic or block neuropeptide function have opened up new clinical approaches to a number of conditions . Thus high efficacy κ opioid-receptor agonists such as CI-977 (enadoline) have more potential for the treatment of pain-related anxiety because the hemodynamic and ventilatory side effects are fewer . Peptoid antagonists appear to be relatively free of side effects possibly because neuropeptide systems are only activated under very selective conditions. Peptoid agonists, on the other hand, can exert extremely powerful actions on brain function and this may be related to the key position neuropeptide receptors occupy in the hierarchy of chemical communication in the brain. Much evidence now exists that very complex neural connections involving diverse areas of the nervous system play a part in pain modulation. Pain signals may be edited at the spinal cord level, in the periaqueductal gray matter and brain stem raphe nuclei prior to reaching relays and gating mechanisms in the thalamus on the way to the cerebral cortex . The perception of noxious stimuli may depend not only on peripheral stimulation and transmission, but also on modulation occurring in spinal cord and higher structures. Accordingly, the subjective sensation of pain can be effectively blocked at the brain level by narcotic analgesics and also at the inflow tract level, explaining the efficacy of spinal or epidural anesthesia . Perceptions of pain from peripheral nocieceptors are integrated and relayed via integrated afferent pathways from the hypothalamus to the reticular activating system via the reticular formation, beginning in the medulla and extending to the midbrain. This pathway links the brain with perception of external events. Pain is a very potent activator of this system, and this explains the importance of the elicitation of pain in the evaluation of consciousness . Modulated signals ultimately reach the medulla oblongata and the sympathetic outflow tracts of the spinal cord leading to the pupils, heart, blood vessels, gastrointestinal tract, pancreas, and adrenal medulla. Norepinephrine is released from the postganglionic fibers into the target organ and both epinephrine and norepinephrine are released into the blood stream from the adrenal medulla. The more intense the stimuli, the more pronounced the response. The levels of norepinephrine generally increase about that of epinephrine and the levels of 11- and 17-hydroxycorticosteroids also increase. Painful stress has two separate components: psychic and somatic; both of these usually combine to stimulate the hypothalamus via a common pathway . In addition to promoting the psychic symptom of anxiety, increased catecholamine levels increase heart rate and myocardial contractility to bolster cardiac output . The analgesia and blunted emotional response to trauma produced by release of endogenous opioids increase the chances of survival after injury . However, the emotional response to opioids has been described as euphoric . The difference between suicide and adventure is that the adventurer leaves a margin of safety. The narrower the margin the more the adventure. It has been suggested that precipitous increases in endogenous opiates secondary to short-lived stress may explain the joys of elective risk-taking behavior . Opiates such as morphine decrease stress-induced norepinephrine release in the hippocampus, hypothalamus, thalamus and midbrain, promoting anxiolysis and sedation as well as analgesia. In addition to their analgesic and sedative effect, opiates decrease the sympathetic discharge associated with the pain of myocardial ischemia and pulmonary edema, and thus exert a mild negative inotropic and chronotropic effect. Opiates also exert a direct depressive effect on the medullary respiration center. However, humoral responses of patients in pain, such as hypertension and tachypnea tend to counterbalance the side effects of narcotic analgesics, such as hypotension from histamine release and medullary ventilation center depression . Acute multifactorial stress increases corticotropin (ACTH) and corticosterone levels. Stress-induced corticosterone release may be involved in the central processing of stress-related phenomena and subsequent learned behavior responses . The mechanism responsible for transient stress induced hyperadrenocorticism and feedback resistance may be a downregulation of glucocorticoid receptors as a result of high circulating glucocorticoid levels elicited by stress. This results in increased corticosterone secretion and feedback resistance. Following termination of stress and decreased circulating levels of glucocorticoids, the number of receptors gradually return to normal and feedback sensitivity normalizes . The effect of chronic stress may also result in augmented corticosterone responses to a previous exposure to stress [58,59]. Adrenalectomy has been shown to increase the frequency of behavioral deficits induced by intense stress . This effect is reversed by the administration of corticosteroids. Learning deficits produced by intense stress may be related to neurotoxic levels of glucocorticoids to hippocampal neurons . Corticotropin-releasing factor (CRF) is the hypothalamic hypophysiotropic hormone that activates the pituitary-adrenal axis . CRF can also be a neurotransmitter in other areas of the brain. CRF is anxiogenic when injected intravenously, probably interacting with noradrenergic neurons in these areas, increasing activity . CRF may also exhibit activity in the dopaminergic areas within the frontal cortex as well, a reaction similar to that promoted by stress. Severe stress also produces increased levels of CRF in the locus coeruleus, hippocampus and amygdala, increasing emotional lability . Autonomic hyperarousal and hypervigilence facilitate appropriate rapid behavioral reaction to threat. Stress-induced levels of cortisol may promote metabolic activation necessary for sustained physical demands necessary to avoid further injury. Elevated catecholamine levels increase heart rate and myocardial contractility to bolster cardiac output as potential compensation for injury during 'fight or flight'. Painful stimulation of somatic afferent nerves is a potent activator of neuroendocrine changes. Immediate inhibition of insulin production occurs coincidentally with an increase in glucogon production, resulting in increased blood sugar (hyperglycemia of stress), free fatty acids, triglycerides and cholesterol to fuel possible 'fight or flight' . Growth hormone and cortisol secretion increase, providing an anti-inflammatory response for potential trauma. Aldosterone production acts to conserve salt and water, bolstering intravascular volume in case of potential blood loss. Previous studies with receptor antagonists suggested that α1-adrenergic receptors were involved in defensive withdrawal in rats . However, β -adrenoreceptor antagonists may also be involved in stress-related responses . Propranolol pretreatment prevents the restraint-induced changes in the behavior of mice after stressful maze testing . These results suggest the involvement of CNS β -adrenergic receptors in stress-related behavioral changes and suggest that β -adrenergic agonists exert anxiolytic effects that differ from those of the benzodiazepines. The activation of β -adrenoceptors may be an important mechanism in the behavioral inhibition induced by CRF, and that the neurochemical mechanisms that underlie the 'anxiogenic' and the 'activating' behavioral effects of CRF are neuropharmacologically distinct. The anxiolytic benzodiazepine alprazolam seems to selectively decrease CRF concentration in the locus coeruleus . The acute behavioral responses brought about by the activation of neurotransmission-modulated humoral responses by psychological and physical trauma represent evolutionary adaptive responses critical for survival in an uncertain and potentially dangerous environment. These compensatory responses were presumably created at a time in the universe when there were no high-tech surrogates for naturally induced environmental stress. Patients in the hybrid ICU environment undergo stress but no natural environmental threat. The highly stressful environment of the ICU may lead to a loss of orientation to time and place. Monotonous sensory input such as repetitive and noisy monitoring equipment, prolonged immobilization, especially with indwelling life support hardware, frequently interrupted sleep patterns and social isolation eventually contribute to the onset of brain dysfunction. However, this high-tech habitat is capable of reversing multiple organ-system insufficiency if the patient is able to tolerate the inherent stress of the environment. Therefore, normally beneficial responses act to the patient's detriment in the artificial ICU environment and it is necessary to block them as selectively as possible. Central nervous system depressants with anterograde amnestic musculoskeletal relaxation and anxiolytic action. Blunts the patient's perception of distress. No analgesic activity. Always used intravenously. Step up dosing required. Continuous infusion useful in selected patients. Stops pain reflex and offers comfort and mild anxiolysis. supression in patients with little reserve. Not titratable. Causes hypotension, tachycardia, seizures and mental status changes in critically ill patients. Pure analgesia without sedation. Effective in stopping pain reflex for hemodynamically unstable patients. Effective real time titration of both analgesia and sedation at the same time in the same patient. Usually used as adjuncts to treatment for complicated patients. Titrating the effect of sedation or analgesia at the level of brain receptors. The pain reflex is normally beneficial, allowing those affected to recognize and avoid impending peril quickly. However, when the pain cannot be avoided, the reflex promotes decompensatory hemodynamic and metabolic changes. An ideal treatment for pain would stop the pain-induced reflex, calming the resultant numeral response, with a minimum effect on other organ-system functions (Table 2). This is not always possible with currently utilized sedatives. Hypnotics such as the benzodiazepines do not resolve pain, they merely superimpose a layer of CNS depression which makes it harder to diagnose where the pain is coming from and what effect it is having on other organ systems. Antipsychotics such as haloperidol do not have any analgesic effect, and their side effects will predominate if given for analgesia, adding more bizarre CNS symptoms to the already agitated patient. Morphine sulfate is the most widely used of all narcotic analgesic/sedatives . The drug is easily titrated by multiple routes and reversible with narcotic antagonists. However, in addition to its sedative action, morphine has profound effects on cardiac hemodynamics. Doses as small as 0.1–0.2 mg/kg can produce orthostatic hypotension in normal subjects due to vasodilatation in the splanchnic beds, decreasing preload and right heart filling pressures . This vasodilatory effect has been attributed to both histamine release and direct effects from neural mediators . The respiratory depressive effect can be profound and unpredictable. Fentanyl is a synthetic opiate 75–200-times more potent than morphine, significantly more rapid acting (1–2 min) and with a shorter duration (30–40 min) . The most used opiate, morphine, frequently promotes hypotension by a histamine vasodilating effect. Compared to morphine, fentanyl promotes minimal histamine release and exhibits significantly less effect on cardiac dynamics than morphine. However, fentanyl's affinity for fat can lead to its accumulation during prolonged use, ultimately 'leaching out' after discontinuation of the drug, limiting its long-term use as a continuous infusion . Ketorolac is a parenteral nonsteroidal anti-inflammatory agent that has almost pure analgesic activity. Sixty milligrams of ketorolac intramuscularly is 800-times as potent as aspirin and approximately equal in analgesic effect to 10 mg morphine sulfate . However, ketorolac has significantly less respiratory and hemodynamic effects than morphine . Ketorolac is useful in blocking the pain reflex, and therefore the increased catecholamine response in patients with marginal hemodynamic reserve. Incisional pain prevents postoperative patients with upper midline abdominal incisions from coughing effectively, causing a significant decrease in forced expiratory volume, and compromising clearance of tracheal secretions. A 'pure' analgesic may decrease risk of nosocomial pneumonia by allowing patients to clear their secretions more effectively with less risk of respiratory depression. ICU patients in heart failure who must undergo painful procedures such as invasive vascular catheterization, chest tube thoracostomy or intra-aortic balloon placement also tolerate narcotic side effects poorly and in whom the hemodynamic effects of a catecholamine release would be decompensatory. The benzodiazepines have been the mainstay of ICU anxiety treatment for a number of years because they offer a relatively wide margin of safety from unwanted side effects . Benzodiazepines with short half lives are especially useful when hour-to-hour titration is required in unstable hemodynamics and for patients with coincident liver disease . Benzodiazepines attenuate stress-induced increases in norepinephrine release in the hippocampus, cortex amygdaloid and locus coeruleus region, effectively reducing conditioned fear and generalized anxiety. Anterograde amnesia occurs almost immediately after intravenous administration and usually persists for 20–40 min after a single dose . However, during intense stress, these drugs may not be able to exert an effective anxiolytic action except in hypnotic doses . All of the benzodiazepines reduce ventilatory responses to hypoxia when administered rapidly or in large doses . Benzodiazepine toxicity usually results in an amplification of their therapeutic effects, but rarely cardiac arrest unless other cardioactive drugs have been given concurrently. α2-Adrenoreceptors are located both centrally and peripherally. Their function is to inhibit norepinephrine release from presynaptic junctions by several negative feedback mechanisms, effectively suppressing neuronal firing and norepinephrine secretion in all target effecter organs containing α2-receptors, including the central sympathetic nervous system . As a result, α2-adrenergic agonists potently inhibit sympathoadrenal outflow, as evidenced by the decreased levels of circulating norepinephrine and the diminution of catecholamine metabolites in the urine. α2-Agonists, which long ago established themselves as antihypertensives, have also been found to possess intrinsic anxiolytic, sedative, analgesic, and antiemetic properties . These attributes make them attractive for use in the treatment of agitation and delirium associated with noradrenergic hyperfunction . α2-Agonists administered concurrently with benzodiazepines or opiate analgesics permit significantly decreased doses of these sedative narcotics, minimizing side effects while maintaining effective levels of sedation and analgesia . Among clinically available α2-agonists, clonidine seems to be the most selective. Clonidine is thought to act by competitively binding opiate catecholaminergic receptors, decreasing the amount of opiates required to get the same sedative effect. As a consequence, respiratory depression, hypotension, and other side effects of narcotic sedatives are significantly attenuated, especially in hemodynamically unstable patients . Clonidine has been shown to decrease the amount of anesthesia required to obtain operative analgesia . Clonidine has been effectively used intrathecally for analgesia in terminal cancer patients who had become tolerant to intrathecal morphine . Clonidine has been extensively used on psychiatry wards to attenuate drug withdrawal syndrome after chronic benzodiazepine and alcohol use . Clonidine has also been proved to be effective in patients with panic disorders due to its anxiolytic action and its ability to decrease the brain noradrenergic neuronal hyperactivity. Clonidine is almost completely absorbed after oral administration, but takes 60-90min to reach peak plasma concentration . A large number of ICU patients are not able to take the medication enterally, or, because of concurrent hemodynamic or metabolic instabilities, it is absorbed erratically by that route. Drug delivery through a transdermal patch takes much longer to reach effective blood levels and a minimum of 2days to achieve a steady state concentration, making this route ponderous for acute care use . Unfortunately, clonidine is not yet approved for intravenous use in the USA, but intravenous administration is common in Europe . Careful titration of intravenous clonidine as a supplement to analgesics or sedatives in severe agitation syndromes in the critical care patients is a new area of clinical investigation. Other α2-agonists not currently used in clinical practice havepractical potential in the treatment of severe agitation and delirium. The highly selective α2-agonist dexmedetomidine has been shown to produce anxiolytic effects comparable to benzodiazepines, but fewer negative effects on hemodynamics. Dexmedetomidine is not yet available for clinical use [93,94]. Because of the clinical side effects and shortcomings of the previous list of therapeutic medications, new agents that act selectively on sensory pathways afferent to the limbic system by decreasing the secretion of neurotransmitters could be more selective in conditioned responses without concurrent sedation and hypnosis. The serotonin reuptake antagonists show promise as superselective anxiolytics, potentially valuable in the ICU where sedative side effects directly affect hemodynamic, ventilatory and metabolic stability during life support management . Serotonin (5-hydroxytryptamine; 5-HT) is involved in numerous physiological processes such as appetite, sleep, pain, sexual behavior and temperature regulation. 5-HT reuptake antagonists have been found effective in the alleviation of depression and panic attacks, and are at varying stages of clinical evaluation in the treatment of obsessive-compulsive disorder, chronic pain, and bulimia nervosa. Selective 5-HT receptor agonists and antagonists show promise in the treatment of migraine, nausea and vomiting, schizophrenia, anxiety, hypertension, and Raynaud's disease . 5-HT interacts with multiple brain 5-HT receptor subtypes to influence a wide range of behaviors. Three main families of 5-HT receptors (5-HT1, 5-HT2 and 5-HT3) have been described. Several different 5-HT receptor subtypes and (5-HT1A, 5-HT1C, 5-HT2 and 5-HT3) may produce anxiolytic effects; 5-HT1A 5-HT2 receptors may be involved in the etiology of major depression and the therapeutic effects of antidepressant treatment; and 5-HT3 receptors have been linked to reward mechanisms and cognitive processes . Serotonin1A agonists seem to be promising for anxiety and also mixed anxiety-depression . Buspirone, with a pharmacologic profile which distinguishes it from the benzodiazepines, appears to hold future promise . Buspirone does not act on the GABA receptor; rather, its most salient interaction with neurotransmitter receptors occurs at the 5-HT1A receptor. Because it lacks the anticonvulsant, sedative, and muscle-relaxant properties associated with other anxiolytics, buspirone has been termed 'anxioselective' . Buspirone does not have a euphoric effect and therefore has a low potential for abuse. Pharmacologic studies on the molecular level indicate that buspirone interacts with dopamine and 5-HT receptors. This action is supported by studies focused on receptor binding, anatomical localization, biochemistry, neurophysiology, and animal behavior. However, the lengthy 'lag period' before buspirone begins to show pharmacologic activity limits its use in acute care areas like the ICU. The recognition that action at 5-HT1A receptors may be aviable approach to the pharmacotherapy of anxiety is evidenced by the number of other agents of this class under development by a number of pharmaceutical companies. The cyclopyrrolone zopiclone functions as a selective hypnotic, extending the duration of slow wave sleep and concomitantly shortening the awake periods . This slow wave sleep inducing effect of zopiclone did not depress rapid eye movement (REM) sleep and shows no rebound of activity in wakefulness or REM sleep after treatment. At the cortical level in rats, zopiclone increases the spectral energy in the Δ band (0.5–4 Hz). This rise in energy can also reach the fast frequencies (β band: 12–16 Hz). This power spectrum is characteristic of a compound having tranquilizing-hypnotic potential. The relatively short duration of action of zopiclone minimizes the residual effects seen upon waking (drowsiness, impairment of psychomotor performance). Binding is thought to occur at the benzodiazepine receptor complex, or to a site closely linked to this complex . Although zopiclone exhibits anticonvulsant, muscle relaxant and anxiolytic properties in animals, its hypnotic effects are the most useful in humans. In clinical trials, zopiclone improved sleep in chronic insomniacs similarly to flurazepam . Minimal impairment of psychomotor skills and mental acuity have been reported in the relatively small number of patients studied to date . Unlike zopiclone which exhibits a hypnotic action, suriclone is a novel benzodiazepine receptor ligand with enhanced anxiolytic properties . Although chemically entirely different from the benzodiazepines, it acts as a functional benzodiazepine agonist with very high affinity for the benzodiazepine receptors. In studies, suriclone and diazepam had a different side-effect profile; suriclone produced mainly dizziness, while diazepam caused sedation . This may reflect the fact that suriclone and benzodiazepines bind to distinct sites or different allosteric conformations of the benzodiazepine receptors. The drug, when effective, has a duration of action between 6 and 8h. There was no evidence of a rebound phenomenon. There was, however, a rapid return to pretreatment level of anxiety, which makes its use as a continuous, titratable infusion attractive. The role of cholecystokinin (CCK) receptors in the development of anxiety is a new field of investigation . CCK is an octapeptide normally synthesized in the gut, but also with large concentrations in the brain where it acts as a neurotransmitter. Central CCKergic neurotransmission has been implicated in the genesis of negative emotions, feeding disorders such as anorexia, nociception alterations, movement disorders, schizophrenia, anxiety and panic disorders . The interaction of CCK with GABAergic inhibitory neurotransmission, mediated probably through CCK-B receptors, could be the neurochemical substrate for anxious type of exploratory behavior. The brain cholecystokinin-B/gastrin receptor (CCK-B/gastrin) has been implicated in mediating anxiety, panic attacks, satiety, and the perception of pain . The isolation of rats for 7days produced anxiogenic-like effect on their behavior and increased the number of CCK receptors in the frontal cortex without affecting benzodiazepine receptors . CCK and benzodiazepine receptor binding characteristics were analyzed in the brain tissue samples from 13 suicide victims and 23 control cases. In the frontal cortex, significantly higher apparent number of CCK receptors and affinity constants were found in the series of suicide victims. The results of this investigation suggest that CCKergic neurotransmission is linked to self-destructive behavior, probably through its impact on anxiety and adaptational deficits . The behavioral effects of an experimental selective CCK-B receptor antagonist CI-988 were investigated in rodents. In three rodent tests of anxiety (rat elevated X-maze, rat social interaction test and mouse light-dark box), CI-988 produced an anxiolytic-like action over a wide dose range. The magnitude of this effect was similar to that of chlordiazepoxide . In contrast, the selective CCK-A receptor antagonist devazepide was inactive . Central but not peripheral administration of the selective CCK-B receptor agonist, pentagastrin, produced an anxiogenic-like action . The pentagastrin-induced anxiety was dose-dependently antagonized by CI-988, whereas devazepide was inactive. CI-988 did not interact with alcohol or barbiturates. Thus, CI-988 appears to be an anxioselective compound unlike benzodiazepines but the anxiolytic-like action was dose-dependently antagonized by flumazenil. The possible involvement of endogenous CRF in the anxiogenic and pituitary-adrenal axis activating effects of CCK octapeptide sulfate ester (CCK8) was investigated in rats . The results strongly suggest that the anxiogenic and hypothalamo-pituitary-adrenal activating effects of CCK8 are mediated via CRF . Tetronothiodin is a novel CCK-B receptor antagonist produced from the fermentation broth of the NR0489a Streptomyces species . Tetronothiodin inhibited the binding of CCK8 (C-terminal octapeptide of CCK) to rat cerebral cortex membranes (CCK-B receptors), but did not inhibit CCK8 binding to rat pancreatic membranes (CCK-A receptors). This finding indicated tetronothiodin was an antagonist of CCK-B receptors and may have use as a superselective antianxiety agent. It is a useful tool for investigating the pharmacological and physiological roles of CCK-B receptors and has no clinical role as yet.